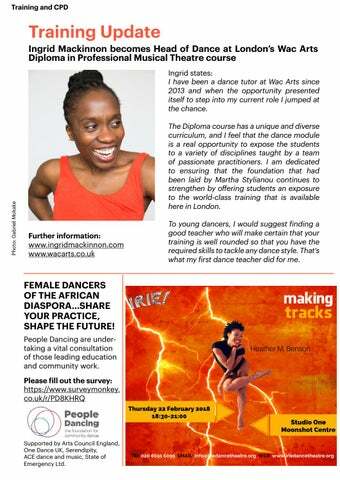 Ingrid states: I have been a dance tutor at Wac Arts since 2013 and when the opportunity presented itself to step into my current role I jumped at the chance. The Diploma course has a unique and diverse curriculum, and I feel that the dance module is a real opportunity to expose the students to a variety of disciplines taught by a team of passionate practitioners. I am dedicated to ensuring that the foundation that had been laid by Martha Stylianou continues to strengthen by offering students an exposure to the world-class training that is available here in London. Supported by Arts Council England, One Dance UK, Serendipity, ACE dance and music, State of Emergency Ltd.
To young dancers, I would suggest finding a good teacher who will make certain that your training is well rounded so that you have the required skills to tackle any dance style. That’s what my first dance teacher did for me.